A strong currency usually goes hand in hand with a prosperous economy, and as a result, the shekel is very active on the foreign exchange (FX) market, attracting the attention of the world’s premier FX strategists. Why? Israel’s decent growth rate and some of the largest natural gas finds in this century—plus the substantial number of Israeli high-tech start-ups purchased by international corporate giants—have brought in billions in investments. In 2013, in fact, the shekel was the world’s strongest currency against the U.S. dollar, and has remained strong, although the shekel-dollar relationship could recalibrate as the U.S. economy recovers from the 2008 recession, and if interest rates rise. Invest through your bank or financial adviser, or via online FX trading platforms that are registered with the U.S. Commodity Futures Trading Commission and are members of the National Futures Association. Every day, millions of shekels’ worth of Israeli government debt are traded. All countries sell bonds to investors to fund social projects and build new infrastructure. The government then pays interest, also known as a coupon or yield, on those bonds. The interest rate is tied to risk: When Israel’s economy grows at a good pace, tax revenue is higher and there is a greater likelihood the investor will be repaid. Slower growth or contraction increases risk. Israel’s creditworthiness is generally gauged by its fiscal management, such as the ratio of deficit spending to budget and debt levels to GDP. Stanley Fischer was at the helm of the Bank of Israel while the country broadly sidestepped the financial crisis in 2008, and his successor, Karnit Flug, has generally followed his fiscal policy. Political and geopolitical turmoil have slim impact on the country’s markets, but its debt market follows global market trends. A recession in the United States, for example, is bad news for Israeli businesses, since trade with the U.S. is vital to the country’s economy. To invest, open a brokerage account with one of the country’s leading financial institutions that manage the bulk of Israeli pension funds. You can also buy Israel bonds, which pay a higher interest rate, in the U.S. through the Development Corporation for Israel/Israel Bonds. The Tel Aviv Stock Exchange (TASE), Israel’s only public stock exchange, lists 461 stocks, and in recent years has been a good investment. For example, if you had called your financial adviser or logged in to your E-trade account on January 1, 2015 and invested in a fund that tracked the Tel Aviv 25, Israel’s benchmark stock index, in August you would have made 17 percent on your money. Take that back another year and you tack on another 12 percent. That’s better than the 1 percent and 12 percent, respectively, you would have earned on the S&P 500. Some of the blue-chip stocks on the Tel Aviv 25 Index include its biggest banks (Bank Hapoalim and Bank Leumi), natural gas exploration companies controlled by billionaire Isaac Tshuva (Delek Drilling and Avner Oil), and the country’s economic pearl and only true corporate giant, Teva Pharmaceuticals. There’s nothing particularly special, however, about the rally in Israeli stocks. Low interest rates and bond yields have led investors around the world to pour hoards of cash into stocks, sending them to record highs last summer, and Israel’s central bank has been lowering its benchmark interest rate for three years. Moreover, the TASE has suffered from falling trading volumes since Israel was placed on the developed-market index, where it competes with the world’s largest economies for investors’ attention. This means that when you want to sell your holdings, it may not be as easy as it is in other markets to find buyers quickly. To invest, open an Israeli brokerage account to get access to the finance professionals who know the Israeli market. About 100 top Israeli firms have chosen to list their shares in the U.S. because they can fetch more capital there, which in turn allows them to invest more in growth. These include companies such as Wix, Sodastream, Check Point and Mobileye. And each year, that list expands with another handful of promising startups. Ask your broker for advice or contact research firms that stay abreast of Israeli macroeconomic trends that affect these U.S.-listed shares and are knowledgeable sources for investment guidance. Supply of housing in Israel is limited for two main reasons: The country is relatively small, and it takes an average of 13 years, start to finish, to build new apartments. Stoking demand are a growing population, cheap mortgages and wealthy foreigners buying second homes. Add it all up and prices are soaring. Today, a two-bedroom, 800-square-foot apartment in Tel Aviv costs about $500,000. Expect to pay slightly less in central Jerusalem. That’s not quite Manhattan or London, but had you bought property in Israel eight years ago, chances are you would have doubled your investment. As the country continues to improve its infrastructure and develop its transportation systems, the value of real estate may increase in the surrounding cities, too. Israel’s government, however, has pledged to stem surging home costs, free up land and spur construction, and recently raised taxes on investment purchases. Research online listings on Homeless and Yad2 if your Hebrew is proficient or contact one of the dozens of real estate brokers in Israel who cater to foreign buyers. For those with less disposable cash, there are real estate investment trusts (REIT) in Israel. Israel has a robust ETP market, the second largest in the world after the U.S. in terms of numbers of products. An ETP is a tradable security that tracks groups of assets such as a stock or bonds index like Japan’s Nikkei 225 or the UK’s FTSE 250. What differentiates it from a mutual fund is that it is passively managed; in other words, there is no fund manager. This also means smaller commission fees. One of the main things distinguishing Israeli ETPs from U.S. funds is that Israeli companies must provide investors the exact return of the ETP’s underlying index, whereas their American counterparts provide what is known as a “best estimate.” To invest, open an account with one of these companies. The vibrancy of Israel’s high-tech scene is second only to Silicon Valley. And because of the constantly multiplying number of start-ups, Israel is a breeding ground for venture capital investment. VC works as follows: A start-up needs money to operate while its revenues can’t match its costs. A venture capitalist offers funding usually in exchange for a percentage of that company. The value of this investment correlates directly to company growth. Investors profit when a start-up is sold to a larger multinational company or when it sells its shares on the open market on going public. With the premium from the sale, the VC can pay its investors a handsome return and seek out other companies to start the whole cycle over again. What are the risks? For one, about 95 percent of start-ups fail. Also, the fate of a company ultimately lies with management. So be aware that you may not see an immediate payoff, if any at all. Like private equity, VC investment is out of the reach of the majority of investors. VCs that fund Israeli start-ups include Jerusalem Venture Partners and Magma Venture Partners as well as U.S.-based Bessemer Venture Partners and Sequoia Capital. What about those who want to own stakes in start-ups but on a much smaller scale? Some start-ups raise seed money through websites such as Kickstarter and Indiegogo, where anyone can invest as little as pocket change in companies or projects in exchange for incentives such as discounted products or simple thank-you notes. For example, an Israeli company called SCiO raised more than $2.7 million from 13,000 people to develop its device that scans objects and reveals what they are on your mobile phone. Sensibo raised more than $178,000 through Indiegogo for its product that turns any air conditioner “smart” and allows you to control it through your mobile phone. Taking this model one step further, Israeli high-tech leader Jon Medved (see box at right) launched OurCrowd in Jerusalem in 2012, where the minimum investment for an accredited individual is $10,000. Some of the Israeli companies in the OurCrowd portfolio include ReWalk, the Nasdaq-traded company that sells a powered exoskeleton allowing paraplegics to walk again, and Syqe, maker of a cannabis-inhalation device for patients that alleviates pain without the high. iAngels, based in Tel Aviv, is similar to OurCrowd. Crowdfunders can be found online. A marriage between traditional venture capital and social responsibility, organizations such as the Israel Venture Network (IVN) provide services, connections and funding for businesses, which aim to reduce socioeconomic gaps across Israel’s many communities. This isn’t charity: The goal is to create viable businesses that generate revenue. This isn’t purely capitalistic either: These companies reinvest profit to address social issues. IVN has funded businesses such as Ravtech, which provides software development and testing services for ultra-Orthodox Jews, who tend to be undereducated and underprepared for modern economies. The company reported income of almost one million shekels ($260,000) last year, according to IVN’s website. Visit the website to inquire about investment. Yaacov Benmeleh is a Tel-Aviv-based Bloomberg reporter who covers Israel’s economy. *You should not make any decision—financial, trading, investment or otherwise—without undertaking due diligence and consulting with a qualified financial adviser or broker. Jon Medved, CEO of OurCrowd, an equity crowdfunding platform, talks about the state of start-ups in Israel. How does start-up investment help Israel? Start-ups are really a critical part of Israel’s growth story. There are $5 billion invested in Israeli start-ups today. More money is now poured into Israel through investing in start-ups than in charity toward Israel. There is a Jewish component: As Maimonides says, the greatest form of tzedakah is to give someone a job. 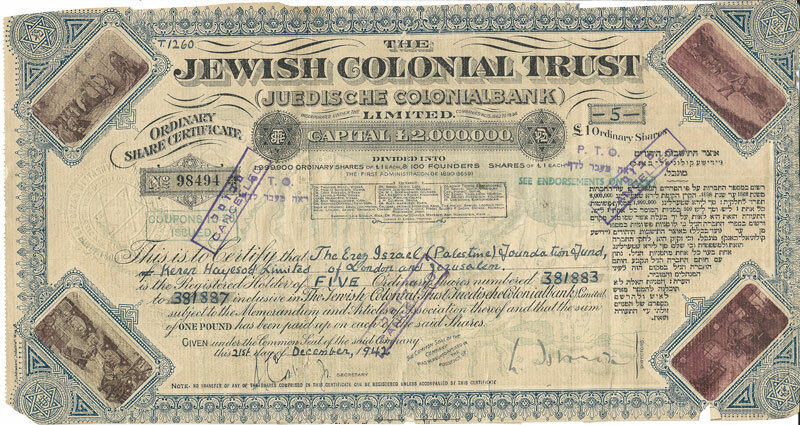 Do people who are not Jewish invest as well? Yes. There’s a lot of non-Jewish investment, including from the Chinese and Japanese. The Chinese investors are not doing it because they are Zionists, they are interested in getting world changing technology, and along with Silicon Valley, Israel leads the way in that regard. Israel has been criticized for being good for start-ups in their early phases but not being able to support them as they grow. In the old days that was the case, but it’s not true anymore. Now there are private equity funds all over Israel, such as the Carlyle Group, that provide later stage funding. The story of the Israeli map app Waze is instructive. Companies wanted Waze to leave Israel for California but its founders said no and it was bought by Google and stayed in Israel. How has this affected the Israeli high-tech scene? Companies are coming to set up shop in Israel in a major way. Last year INTEL announced a $6 billion investment in Israel and its campus has over 10,000 employees. Apple’s second-largest research and development center is in Herzliya. Amazon is doing all their next-generation R&D in Israel. Ebay is in Israel. The list goes on and on. Has the recent spate of violence discouraged investors? Most investors have gotten the message that in Israel we know how to handle risk. In the last war we had 50 days of missile attacks, the missiles didn’t stop us. I don’t think knives will. Rest of the supporting ways are valid but real estate is more efficient as Israel have beautiful beaches where people love to wander. So if people will invest in it then can gain more benefits. Really clear breakdown of the options for existing investors in Israel and potential investors. I am from the hindu republic of india and i want to support israel for two reasons. HIndus and Jews are genuinely opf the sme thoughtful peaceful coexistence process . And both out countries are affected by Islamic terrorisms. Now i am absolutely not clear with the options menitoned above . I just want to invest my rupees i earn in india and the dollars i earn when i come to US, in israel and how can i do it?